What is E Verify? It is a free web-based, electronic system used to verify the eligibility of employment for newly hired employees and existing employees assigned to work on qualifying federal contracts. E Verify ensures a legal workforce, protects jobs for authorized workers, deters document and identity fraud and works seamlessly with Form I9. 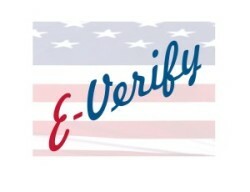 While E verify is a Federal program, each state determines its E verify compliance requirements making it extremely complex to determine from state to state the E Verify regulations. © 2014 www.carolinaaccounting.com. All rights reserved.